Pin values can be set high or low, or into slow or fast toggle in real time, all at a click of the mouse. 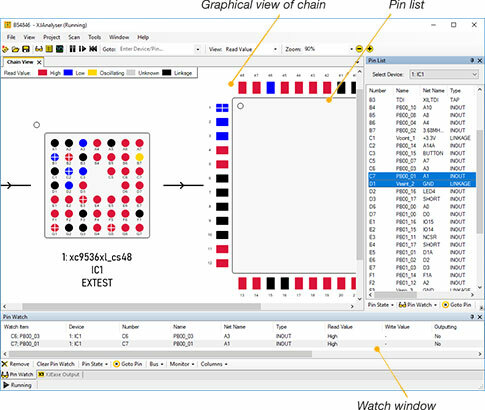 The values are then displayed by colour-coding the pins. Pins can also be colour-coded by various properties, such as input/output. 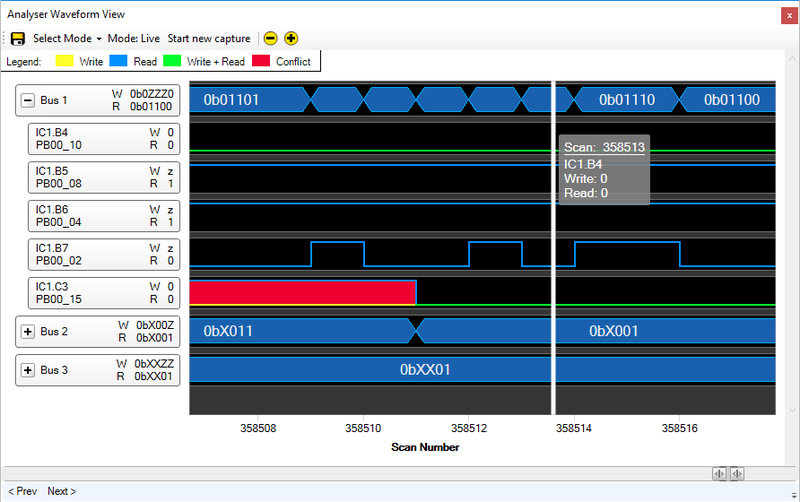 Monitor the values and properties of all the pins on your JTAG-enabled devices, even BGAs, in real time. XJAnalyser can run SVF and STAPL / JAM files that apply to any sequence of devices on a board. Any headers and trailers are set up automatically. 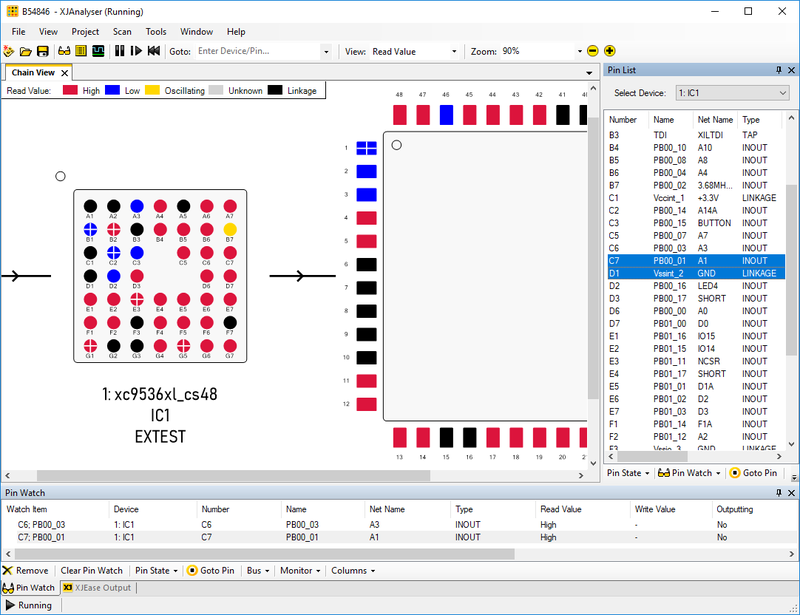 XJAnalyser can capture the values being driven onto the JTAG devices of a known good working board. These values can then be used to identify differences between boards exhibiting unexpected behaviour and a known good board. 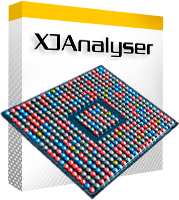 XJAnalyser can be used to help with debugging of the JTAG chain, by giving feedback on the number of devices it can detect as well as the ID codes of those devices. See here for more information. You can select pins and place them in a watch window to separate their changes from all of the pins around them on a device. The Pin Watch can also be used to build a bus from a number of pins; you can then write a value to the bus to set all of those pins at once. 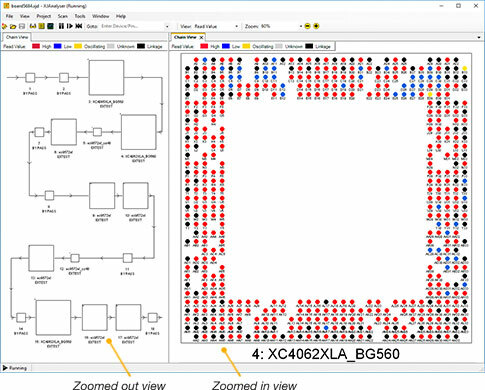 XJAnalyser gives you the flexibility to see the circuit as a whole or close up, with user-definable zoom levels. You can also split the screen and view different parts of the circuit at different magnifications. 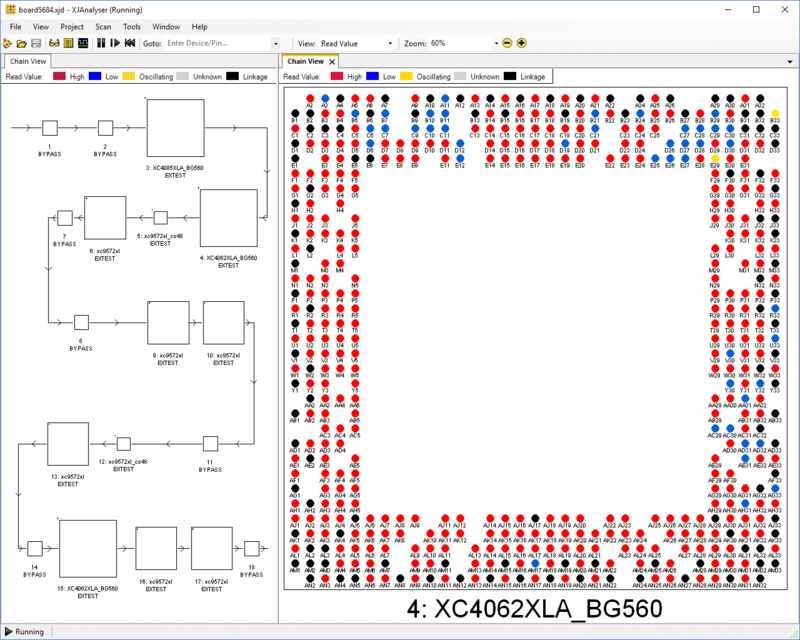 XJAnalyser can either perform continuous write-read JTAG cycles, giving instant feedback on signal changes, or it can iterate single cycles under user control, allowing manual changes between each cycle. If the device geometry is incorrectly specified, or not specified, in the BSDL file, you can change the number of pins on each side to reflect the actual geometry of the device. There is also an option to rotate devices.